Mumbai’s posh five star luxury hotels Oberoi-Trident is one of the places that has been under the attack of the terrorists for more than thirty-five hours. Here are the set of events in the Oberoi-Trident hotel since Wednesday night. 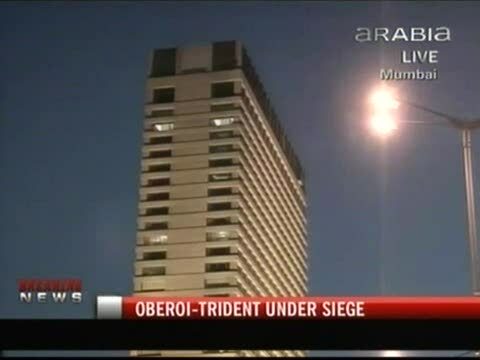 On November 27, at around 9:35 pm, Oberoi-Trident hotel came under attack when terrorists stormed the hotel. Till mid night, unknown number of people still trapped inside the hotel. Sources initially confirmed gunmen inside but were not sure about the numbers. The operation to flush out terrorists continued till November 28 morning. The GOC said there are about 12 terrorists holed up in three places — about two-three persons at Nariman House, five to six at the Taj hotel and the rest at Oberoi-Trident hotel. Elite commandoes of the topline security forces from army, navy, NSG and Rapid Action Force got involved in the raging encounter with unspecified number of heavily-armed terrorists in Oberoi-Trident hotel. Throughout the day, grenade explosions set various floors. Two hotel staff and one security guard were confirmed dead. Army was rushed in five columns from adjoining areas to beef up its strength, ahead of a final effort to rid Oberoi-Trident in from the grip of extremely trained terrorists. About 200 people have been trapped and terrorists exploded grenades that set the roof ablaze amid exchange of gunfire. Two units of MARCOS withdrawn from the Taj and Oberoi-Trident hotels after the National Security Guard (NSG) arrived in Mumbai. They were re-deployed to participate in the final assault following after NSG’s request. Two marine commandos and 14 Army troops were injured in the operation at both Taj and Oberoi Oberoi-Trident hotels. NSG commandos launched an operation to flush out terrorists and soon fire was seen emanating from the fourth floor of Oberoi-Trident hotel. The fire engulfed several rooms and reportedly broke out in the hotel. Security agencies captured an LeT activist Abu Ismail alive. They find out that he hails from Faridkot in Pakistan. On November 28, during midnight, Director General of National Security Guard (NSG) J K Dutt said two terrorists are holed up in the 8th floor of the Oberoi hotel while in the Trident section the combing operation has been completed. Dutt said we do not have any report of any terrorist being holed up in Trident. A minor explosion took place at the Trident hotel where about 100 people were believed to be trapped inside. The security forces began evacuating Trident hotel. 11 pm: Firing around Colaba, terrorists arrive inside Taj hotel, Gateway of India. 12 midnight: Firing of hand grenades inside Taj Hotel, police gheraos the hotel, ready to shoot on order, area cordoned off. 1 am: Massive blast inside the central dome of the Taj Palace hotel, flames around the structure, smoke cloud lift up to the sky, two rounds of hand grenades. 2 am: One round of hand grenade thrown outside the window from Taj’s heritage wing to the park infront of the Gateway; police ready to fire and enter in big numbers inside the hotel. 2:30 am: Army deployed, two trucks full arrive and enter hotel lobby and outside. Media asked to move back by 100 metres. Fire spreads across top floor of Taj heritage wing. 2:45 am: Some people exit from kitchen fire exit and are taken from the new wing of Taj to the back exit to leave, guided by police. 3:00 am: Fire engines arrive, police sirens go off. Shooting and gunfiring heard inside lobby and heritage building. Fire spreads quickly to the left dome of the hotel, engulfs entire column in flames. 3:30 am: People scream from inside the heritage building as fire spreads. People seen at windows howling for help. Fire engines start rescue, try putting out fire on top floor with water sprays. 3:45 am: Fire engine ladders pull out people from windows while simultaneously trying to get the fire doused. People are slowly brought down as firemen run with search torches, break windows to pull people out. 4:00 am: Men, women climb down, howling as they are rescued. Most of them say they were told to stay in their rooms. Some of them had seen the terrorists shooting around. Most of them come down shocked by smoke and firing. Ambulances take them to nearby hospitals. 4:30 am: Another bout of big firing inside hotel. Action shifts from left heritage site where the fire continues to spread quickly to middle of the hotel as terrorists run from the centre dome to the new tower. 5 am: Solid rounds of firing, police step up heat with commandos and bomb squads arriving. Public told to move away. Fire engines continue rescue as people are brought down. Fire flames right again, both central and left dome in fire again. 5:30 am: Fire appears under control, but terrorists holed up in new tower in the exclusive club of Taj called Chambers. 100-150 locked in there, most influential corporates, businessman, policy makers at the venue. People kept hostage. 6:00 am: Police, navy, army forces take control and say they are ready for encounter. Firing across the building. Windows are broken. Personnel gherao Gateway and top floors of Taj with sniper guns. 7:00 am: Policemen spread across the floor on the ground of the Gateway of India. Another round of firing. 8:00 am: People are brought out to the lobby, some people told to duck down behind scaffolding as a new round of firing takes place between terrorists and the police outside the main porch. 8:30 am: Another 50 people are brought out of the Taj club called Chambers and taken slowly by the police in Best buses, to evacuate them. 9 am: More rounds of firing, many more people stuck inside. 10 am: Police almost finishes encounter, until one more round of firing happens. 11 am: Many people are taken on stretchers outside in critical care vans, some alive, some injured and some dead. 6:00 pm: Three fresh explosions have been reported at the Taj hotel in Mumbai on Thursday and rescue operations are on. 7:00 pm: Fire flared up at hotel Taj Mahal Palace for the third time, with huge flames leaping up from the roof of the heritage old wing of the building. 08:20 AM: Heavy gunfire can be heard from Nariman House. Ambulances have beeen positioned closer to the building. Fire brigade personnel are present on the scene too. 08:11 AM: Helicopters make Nariman House look like a war zone. Routes have been cleared for ambulances. 08:10 AM: Five commandos have landed in choppers atop Nariman house, and opened fire. Two to three terrorists are believed to be holed up in the building. Sources say that a man can be seen on the seventh floor of the Oberoi wing of Hotel Trident. He can be seen talking on his mobile phone and dropping something from the balcony. Army men, who have surrounded the hotel, have moved in. One NSG commando has been seriously injured in Taj Hotel, informed Mumbai Police Commissioner Hassan Gafoor. 07:48 AM: Another explosion has reportedly taken place at Nariman House. The area near Hotel Trident is bustling with activity. Four trucks with over 50 NSG commandos have left the hotel complex. Speakers are being mounted near Air India building , and the names of the victims killed in Hotel Trident would be announced soon. Relatives of both hostages and victims have started gathering near Hotel Trident. 05:10 AM: Civilians are still trapped inside Hotel Taj, according to the latest reports. However, the number of civilians is not yet known. Things have quietened down at the Hotel Taj, Hotel Trident and Nariman House. Sources say that the offensive by security personnel has been halted for the time being and will be resumed in the morning. 03:15 AM: Two explosions have taken place at Nariman House. Three terrorists are suspected to be hiding inside the building. The power supply to Nariman House has been cut off. 02:04 AM: Six to eight men of the Anti-Terrorist Squad, wearing bullet-proof vests, have entered Hotel Trident from the side of the Air India building. Personnel from the Army, NSG and RAF have already entered the hotel. Only one terrorist is still holed up at the Taj Hotel, claim NSG sources. 12:52 AM: Fresh firing has erupted at Taj Mahal Hotel ,where the terrorists and the security personnel exchanged three rounds of gunfire in the last 15 minutes. All the buildings near Nariman House are being evacuated. The residents of nearby buildings are being evacuated by the police and RAF personnel. 12:11 AM: Security personnel and terrorists have reportedly started exchanging gunfire at the Nariman House. Seven hostages have been rescued from the building. Firing has resumed at Taj Mahal Hotel, according to reports. 11: 37 PM: Residents staying in buildings near the Nariman House have been asked to evacuate. Some members of the local Shiv Sena unit have also reached the spot. 10:55 PM: NSG personnel have taken positions outside Hotel Trident in Nariman Point, on the road between NCPA and the hotel. An army truck with over 20 commandos has stationed itself near Hotel Trident. Low-intensity gunshots can also be heard from inside the hotel. Prime Minister Manmohan Singh has rushed to Mumbai and is visiting the injured victims at JJ Hospital. 10:24 PM: The death toll in the Mumbai terror attacks has reportedly crossed 125. Another explosion has taken place in the first floor of the old building of the Taj Hotel and several rounds of gunfire have been heard. Columns of Army personnel are marching into Hotel Trident. 09:42 PM: Firing has started again at Trident Hotel, after a lull of 30 minutes. A senior official from the Israeli Consulate has arrived at the Nariman House, where two Israeli families are being held hostage. However, he refuses to divulge much information about the hostage situation. The authorities say that the situation at Nariman House will be tackled only after the hostage crises in Hotel Trident and Taj Hotel come under control. 09:10 PM: Five more foreigners have been evacuated from Hotel Trident. At Nariman House, commandos have started entering the building as the offensive against the terrorists escalates. 08:30 PM: Vicky Nanjappa reports from the Taj Hotel that massive explosions are taking place inside the hotel. A major fire has broken out at the Trident Hotel. The 13th and 14th floors of the hotel are on fire. Prime Minister Manmohan Singh has left for Mumbai, in the wake of the terror attack. The ongoing operations against terrorists in three places were in their final stages and would be over soon, says Maharashtra Director General of Police A N Roy. Major General R K Hooda, General Officer Commanding, Maharashtra area, said that the Army and other security agencies had completed the first round of room-to-room combing at the Taj Mahal Hotel. But he said the operation was not yet over and there may still be terrorists holed up inside the hotel. A huge convoy of army trucks has reached Nariman House. A BEST van can also be seen in the vicinity, and it might be there to cut off the power supply to the building. Two Israeli families have been reportedly held hostage in Nariman House. 08:00 PM: The Taj Hotel’s General Manager’s wife and three children have been reportedly killed in the attack. The locals are distributing biscuits to the security personnel deployed at the Nariman House. An ambulance, from Saifee Hospital, is distributing water. The chief of the Special Action Group has arrived. 07:49 PM: This road in the heart of Mumbai’s tourist district looks worse than a scene from Kashmir. The range of forces here is incredible. The deployed personnel are from the NSG, RAF and Black Cats, apart from the city’s police. The city hadn’t witnessed such a tight security blanket even during the infamous Mumbai riots. Major General Hooda has reached Nariman point. 06:07 PM: 70 more people have been evacuated from Trident. 05:57 PM: Railway Additional DGP K P Raghuvanshi has been given temporary charge of ATS following Hemant Karkare’s killing in Mumbai terror attacks, says Deputy Chief Minister R R Patil. 05:45 PM: Lashkar-e-Tayiba has denied involvement in the terrorist attacks in Mumbai. Death toll in Mumbai terror attacks 101; 288 injured, six of them critically, says Chief Minister Vilasrao Deshmukh. 05:31 PM: Commandos are in NCPA apartments across the road from Trident hotel, and firing at the terrorists, police officers said. 05: 26 PM: Gunshots have been heard from inside Oberoi hotel where terrorists are holding around 35 people hostage. 05:08 PM: IAF keeps seven transport aircraft and one VVIP aircraft on standby in Delhi for airlifting troops and leaders at short notice. 05:05 PM: Grenade sound could be heard from Nariman House building. The residents of Prem Bhavan, next door, have moved out. Nariman House area wears a deserted look. 04:55 PM: About 18 to 20 rounds of gunfire has been reported from Trident Hotel. 04:45 PM: Lot more commandos have arrived outside Nariman House. A team of commandos is scaling the building. Helicopters overhead are providing cover. 04:25 PM: Loud explosion has been heard outside Taj Hotel. 03:54 PM: Third grenade blast has been reported from the Trident Hotel (Oberoi). 03:15 PM: Two grenade blasts have been heard from Trident hotel. 02:54 PM: Grenade blast has been reported from Nariman House in south Mumbai, where six terrorists are holed up. One terrorist had been gunned down earlier. 02:33 PM: Navy helicopters are chasing a Vietnamese registered ship, MV Alpha, which is believed to have dropped terrorists near Bombay. Navy Chief Admiral Sureesh Mehta is closely monitoring the situation. 02:10 PM: Our correspondent Krishnakumar K reports that the first 4 floors of the six-storeyed Taj Hotel have been sanitised. Forty bodies have been recovered so far. NSG sources add that four fidayeen (suicide bombers) have been killed in the final assault. 01:50 PM: Director General of Police A N Roy says all people trapped inside Taj Hotel have been rescued and the hostage situation is over. “No negotiations with the terrorists. Either we will kill them or nab them alive,” says Roy. Meanwhile, an National Security Guard spokesman says 200 more NSG commandos were being rushed to Mumbai. 01:13 PM: Trident Hotel (formerly Oberoi), has said that it is under the control of police and security forces, and they are monitoring the situation in wake of the terrorist strike. 01:23 PM: Handgrenades lobbed from Oberoi Hotel in south Mumbai where terrorists are holed up. 12:42 PM: Police say one terrorist holed up inside Nariman House has been killed. Six more terrorists are suspected to be hiding inside the building. 12:14 PM: At least four terrorists are holed up in the Taj Hotel where 40 to 50 guests were still trapped, says Major R K Hooda, General Officer Commanding of Maharashtra, Goa and Gujarat. Two bodies have been brought out of the Taj Hotel and taken away in an ambulance. 11:25 AM: Maharashtra Deputy Chief Minister R R Patil has said that there can be 10 to 12 terrorists involved in the terror attack inside Taj Hotel. Five of them have been killed and one of them arrested, he told media persons outside the hotel as security forces prepared to launch an assault to end the terror. 11:09 AM: Latest reports say that the Navy and Army have taken control at Oberoi. Meanwhile, a child of foreign nationality and an Indian maid have been seen coming out of Nariman House in South Mumbai. Reports also say that US intelligence officials are among the foreigners killed at Taj Hotel. 10:57 AM: Fire brigade personnel have started rescuing people from Taj Hotel. Top French Nuclear physicist has also been rescued from the hotel. 10:40 AM: Smoke has been seen billowing from the new building of the Taj Hotel — which stands next to the old building where terrorists are holed up. While NSG operation was on in the old building, fire brigade personnel were trying to douse fire in the new wing. 10:30 AM: The number of policemen killed has gone up to 16. Prime Minister Manmohan Singh will address the nation after 7 PM after the Cabinet meeting. The Maharashtra state Cabinet will meet at 2 PM. 09:30 AM: Terrorist out in the open! A terrorist holed up inside Nariman House jumps to the adjacent building. Meanwhile, an emergency Cabinet meeting has been called at 1100 hours. 09:27 AM: IB has arrested a Lashkar-e-Tayiba terrorist of Pakistani origin from Mumbai. The e-mail sent after terror attacks has been traced to Russia. Authorities say the mail was sent by Lashkar operatives. They also believe that the Lashkar terrorists came directly from Karachi to Mumbai. 09:30 AM: Firing has been heard near Nariman House in Colaba. Police have cordoned off the area amid reports that terrorists are holed up in the building. 09:09 AM: Curfew has been clamped in Colaba after firing intensified in the Taj hotel. Police are using smoke cannisters to disable terrorists’ vision. Meanwhile, Hostages are being evacuated from the Taj hotel even as gunbattle rages. A journalist has been injured in the firing. All international flights from Mumbai have been cancelled. 08:55 AM: Agencies have reported that terrorists are holed up inside the Cama Hospital. Commandoes have started firing at terrorists. 08:05 AM: Fresh firing erupted early on Thursday in Taj hotel as commandos moved in to flush out terrorists holding some foreigners hostage. Sharp shooters of army, NSG and other security forces moved into Mumbai’s landmark hotel. Police believe that the number of holed out terrorists could be three or four. Another luxury hotel Trident (formerly Oberoi) was under siege with some terrorists holding some foreigners hostage. 07:50 AM: More grim news is coming in from Taj Hotel, where several staff members have been feared killed in the terrorist attack. Over 100 guests are still stuck inside the hotel, where two terrorists are reportedly holed up. At Nariman House in Colaba, onlookers informed that the police exchanged fire about an hour ago. The place looked like a riot-hit site, swarming with police officials and military trucks. Most people have been holed up here since an explosion shook the area at 10.30 pm. The explosion occurred when the terrorists lobbed hand grenades at the local petrol pump. The blast was followed by a gunfight between police forces and the terrorists. Terrorists were in touch with Karachi via satphones: again Pakistan!! According to highly reliable intelligence sources, two boatfuls of weapons and some 18-20 terrorists most likely came from Karachi in Pakistan. Intelligence agencies are zeroing in on the Lashkar-e-Tayiba as the agency behind the terror attacks. The initial interrogation of terrorists captured in Mumbai has yielded some basic information. According to sources, for some time the directions kept coming “live” to the terrorists in Mumbai via satellite phones. The intelligence sources said information is coming out quite rapidly because some six terrorists, who are in the custody of the Mumbai police, are under interrogation right now. He said the entire operation was led by Pakistani operators of the LeT but he doesn’t rule out the involvement of some local youngsters in it. 09:27 AM: IB has arrested a Lashkar-e-Tayiba terrorist of Pakistani origin from Mumbai. The e-mail sent after terror attacks has been traced to Russia Authorities say the mail was sent by Lashkar operatives. They also believe that the Lashkar terrorists came directly from Karachi to Mumbai. 06:20 AM: The hostage crisis continued at Taj Hotel in the wee hours of Thursday as Army commandos moved in to flush out the terrorists. Meanwhile, Maharashtra Chief Minister Vilasrao Deshmukh assured that there was no hostage situation at Cama Hospital in South Mumbai. 04: 23 AM: Vaihayasi Pande-Daniel reports that the fire that engulfed the old wing of the Taj Mahal Hotel in Mumbai has been put out. Though the major conflagration has been contained, flames continue to flicker, occasionally leaping into life, at the corner of the heritage wing. Police and fire brigade personnel have placed ladders against the side of the building, and are bringing hotel guests out through that means. Some foreigners who had been evacuated were being ferried to a nearby hospital for first aid, while others are being taken by bus to alternate accommodations. Officials here estimate that most of the guests inside the hotel have been evacuated. Commandos of the Indian navy meanwhile have staked out vantage points covering all exit points, while others of their number prowl around the perimeter of the hotel. A group of Taj employees stood clustered on the pavement opposite the hotel, staring at the hotel through tear-filled eyes. They had been told to leave, they said but clearly, they could not bring themselves to walk away from a hotel that, to them and to most Mumbaikars, is shared heritage than mere hotel. Elsewhere, an attractive young woman attempted to restore some semblance of order to her silver-zari sari. She was drenched, and still disoriented from her experiences of the night. 03: 57 AM: Though the firefight at the Oberoi is still far from finished, the takeover of the operation by units of the Indian Army appears to have taken the South Mumbai hotel off the ‘critical’ list. Vaihayasi Pande-Daniel reports for Rediff that most of the one dozen fire trucks that had been stationed around the Oberoi have been dispatched to the Taj Mahal Hotel, where a blazing fire threatens to devastate the old wing of the iconic hotel. Daniel cites police sources as saying the army commandoes are doing a systematic sweep of the hotel, lobbing grenades ahead of them to take out hidden dangers before securing each successive wing of the hotel. The constant bang of grenades from within the hotel continues to alarm the crowds gathered outside the hotel, and kept at a distance by police. Not all of them have come to gape, however. Vadhavan, a businessman from New Delhi, sits in rumpled attire on the parapet of Marine Drive, trying to stay awake. The flushing out operation is far from finished; Vadhavan’s wait threatens to extend through what remains of this night. 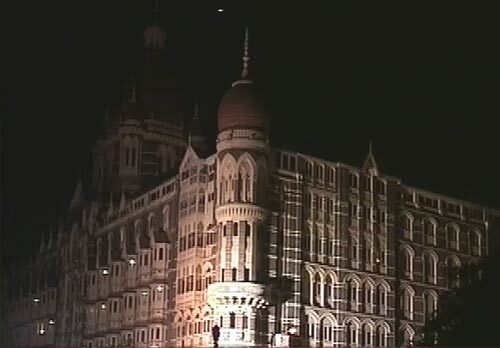 3:42 AM: At the Taj Hotel, where a joint operation involving the Mumbai police, the Central Reserve Police Force and a commando group from the Navy is engaged in flushing out terrorists within the premises, PTI reports that almost all the guests have been brought out to safety at the time of writing this. The situation continues to remain dangerous, however, with an indeterminate number of terrorists within the hotel, two of whom are believed to be holding a group of tourists hostage on an upper floor. Meanwhile, the fire that erupted in the old wing of the historic hotel has spread alarmingly. The fire now burns bright across at least two mid-level floors of the old wing, and thick clouds of black smoke spew from the signature minaret that crowns the hotel’s roof. 03: 06 AM: A little over four hours since gunshots first erupted at the CST railway terminal, and coordinated terrorist attacks spread to various parts of South Bombay, the situation remains fluid. At the Taj Mahal Hotel, a contingent of Navy commandos has joined the police and Central Reserve Police Force personnel attempting to enter the hotel and flush out the terrorists. From within the hotel, word is that occasional explosions, and sporadic gunfire, continue at the time of writing this. At the Oberoi Hotel, the army has taken over the operation and entered the hotel; it is now reportedly engaged in flushing out the terrorists hiding within. At the Cama Hospital, a specialty medical center for women and children, official sources say terrorists are holed up on the fourth floor and have been firing from that vantage point. Police have surrounded the hospital and are engaging the terrorists in an ongoing gun battle. 02:50 AM: Communist Party of India-Marxist leader and Member of Parliament N N Krishnadas, who is staying at the Taj Mahal Hotel, reports that as late as 2:10 AM, explosions could be heard from within the premises. Krishnadas told CNN that he is holed up in a room, and outside of the noise of explosions and gunfire has no real idea what is happening within the premises. Meanwhile, the fire that broke out in one of the hotel’s middle floors has been spreading upwards, adding a fresh hazard both to the police and CRPF personnel engaged in the anti-terrorist operation and to the guests within the hotel. Even as police sources upped the toll in today’s terrorist strikes in Mumbai at 80 and counting, police continue to lay siege to the Taj Mahal Hotel, where two terrorists are believed to be holding at least 15 guests hostage on one of the upper floors of the hotel. The police are at this point in time unsure whether the two hostage takers are the only terrorists within the hotel. Meanwhile, the Indian Army has moved into the Oberoi and the Trident, the two other South Mumbai hotels targeted in today’s terrorist strikes. A battalion of the Indian army entered the Oberoi and began an operation against the terrorists holed up inside. The army was called in after the police took several casualties, including the deaths of some senior officers. With the army now in charge of this phase of the operation the first time the Indian army is operating in the city since the 1992 riots the police has fallen back and is focusing on cordoning off the area. Vaihayasi Pande-Daniel, reporting for Rediff.com from outside the Oberoi Hotel, reports that with the cordon being drawn tight, people waiting outside are in a state of panic, and desperately searching for information. A group of senior bankers from Hyderabad are among those inside the hotel to attend a conference; their Mumbai-based colleagues are outside, awaiting word of their fate. 02: 25 AM: Mumbai’s Anti-Terrorist Squad chief Hemant Karkare died of bullet wounds in the ongoing battle against armed terrorists that is raging across several parts of South Mumbai. Vijay Salaskar, an officer attached to the Mumbai police who has been famed as an ‘encounter specialist’, was seriously injured in the ongoing gun battle and has been rushed to hospital. In all, seven Mumbai policemen are believed killed thus far. It is yet unclear whether the terrorists are still on-site, have left, or been killed. Sharma said there had been no firing from within the terminus for the last two hours. “Despite this, we are not allowing people to go into the station as we are worried that the terrorists might have planted bombs or left live grenades in the station,” he said. Sharma said the official belief is that the two terrorists had sneaked out of the station in the confusion following the original assault. Sudhir Dalvi, a sub-inspector attached to the Mumbai cell of the Anti-Terrorist Squad, told Sheela Bhatt for Rediff.com that his boss, ATS chief Hemant Karkare, and senior police officers Vijay Salaskar and Additional Commissioner of Police Ashok Kamte, were killed in an incident outside Mumbai’s Cama Hospital. Meanwhile, the army has moved into the Trident Hotel, the third five-star hotel in the South Mumbai region that had been targeted in tonight’s coordinated terrorist strikes. 02:10 AM: It is now believed that 15 people, at least seven of them foreigners, have been taken hostage by two terrorists and are being held on the roof of the Taj Mahal Hotel. Rakesh Patel, a London-based businessman who managed to escape, told NDTV that the two terrorists, estimated to be in their early 20s, came to a restaurant on the ground floor of the Taj, rounded up the hostages and took them to the 18th floor. Patel, who was one among them, managed at that point to escape. Patel said the terrorists asked if any of the hostages were carrying American or British passports, and said he got the clear impression that they wanted foreigners. 01:50 AM: Krishnakumar reports from the Juhu region that a bomb went off in a taxi that was speeding along the Western Express Highway from Vile Parle towards Andheri, killing two people and injuring two others. side. A bystander and a person in the taxi were killed. Reports indicate that this was perhaps the night’s highest-intensity blast. Krishnakumar reports that the taxi’s doors were found a distance of 50 meters or more away, and body parts of the victims had been thrown even further. 01:43 AM: At least two suspected terroristswere shot dead minutes earlier at the corner of Mumbai’s Chowpatty. Rediff’s Vaihayasi Pande-Daniel, who is on the site, reports that the area has been cordoned off and is swarming with police officers; the Skoda is under guard and a cellphone, a jacket, and items of footwear are strewn around the vehicle. Meanwhile at the Taj Mahal Hotel, the standoff between police, who have surrounded the hotel, and terrorists who are holed up inside, continues. A short while ago, power went off in parts of the hotel, adding to the sense of panic and fear. Well known food critic Sabina Sahgal Saikia, who is inside the hotel, told NDTV on phone just now that the guests are terrified, and unaware of just what is happening around them. It is unclear at this point in time whether the power has been turned off by the police as they battle the terrorists. 01:27 AM: Rediff’s Vaihayasi Pande Daniel calls in from the Marine Drive region to report that the approaches to the South Mumbai area have been shut down, and that sounds of firing are audible as far away as Mumbai’s famed Queen’s Necklace stretch, though the source of the firing is unclear. Meanwhile, a foreign national who managed to escape from the Taj Mahal Hotel, where a state of seige currently exists, told NDTV that armed and masked gunmen were wandering around inside the hotel, looking for people with American or British passports. The eyewitness account appears to confirm the growing belief among law enforcement circles that this latest attack is aimed directly at foreign nationals — hence the choice of star hotels as prime targets. They further theorize that automatic weapons are being used rather than bombs in order to orchestrate such targeted mayhem. Meanwhile, the real dangers of the situation are being exaggerated by a proliferation of rumors. One such that has been aired on a few channels including CNN suggested that firing was taking place at the JW Marriott, another five star hotel in the Juhu region of suburban Mumbai. A source in the hotel however confirmed to Rediff just now that there was no alarm at the hotel, and no incident of any kind had taken place. 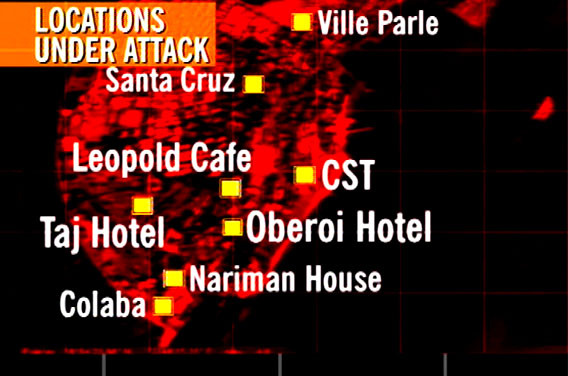 12:44 AM: A gun battle is ongoing in the Taj Hotel in Colaba. Within the last ten minutes, a guest at the hotel got word out to CNN via email that a grenade had exploded within the hotel premises just then. Additional Commissioner of Police AN Roy and other officials confirmed that some armed terrorists are holed up in the iconic hotel. Police officials said they have no information of a hostage situation; they say guests have been sequestered in safe areas of the hotel, and the police are now engaged in flushing out the terrorists from their hiding place. Latest reports say that the Navy and Army have taken control at Oberoi. Meanwhile, a child of foreign nationality and an Indian maid have been seen coming out of Nariman House in South Mumbai. Reports also say that US intelligence officials are among the foreigners killed at Taj Hotel. You are currently browsing the Free to share your thoughts blog archives for November, 2008.